Doing my best right now. Getting as much information into peoples hands as possible on the case. I wrote a letter and faxed and sent them by FedEx to the DA, Judge, Mayor, and the Governor. Their contact information is at the bottom of this post. I am writing in regards to Justin Beno’s court case as referenced above. I read in the Green Bay Press Gazette that these two vehicles are to be crushed. If you could please take a moment to read this, I know there is a solution that would help the community. Reviewing the information, I have learned that there are potentially some errors regarding imported vehicles and VIN/Chassis numbers. I am highly knowledgeable with vehicle importation and have worked with the National Highway Traffic Safety Administration (NHTSA) with these types of vehicles. There is a solution, that I do not think was explored. The cars can be sold at auction for export only. Vehicles that are seized by customs and other agencies are sold at auction every day. Manheim Auctions offers government sales, more information about them can be found at the following website link: http://www.manheimgovservices.com . The money can be used toward positive things that will benefit the community. According to the Code of Federal Regulations Part 565. Vehicles imported into the United States under 49 CFR 591.5(f), other than by the corporation responsible for the assembly of that vehicle or a subsidiary of such a corporation, are excluded from requirements of §§565.13(b), 565.13(c), 565.13(g), 565.13(h), 565.14 and §565.15. (r) VIN means a series of Arabic numbers and Roman letters that is assigned to a motor vehicle for identification purposes. § 565.14 Motor vehicles imported into the United States. (a) Importers shall utilize the VIN assigned by the original manufacturer of the motor vehicle. A Nissan Skyline does not have a 17 digit VIN number, as assigned in the US. It was built to Japanese standards, which do not require a 17 digit VIN, however they do have a chassis code that is stamped into the firewall. It is my understanding that this chassis code was not tampered with. This is the VIN as prescribed in the Code of Federal Regulations part 565. 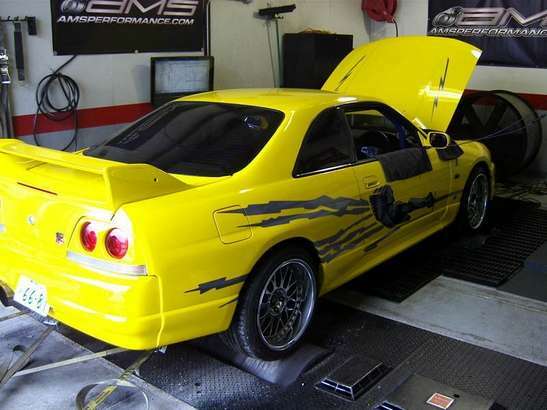 The yellow Nissan Skyline has been a huge part of a lot of people’s lives growing up. I have contacted several people that were involved with the Fast and Furious movie that the car appeared in, and they are shocked that this is happening. This vehicle was also raced at Pikes Peak in 1999, and set a showroom stock record. By crushing this car, you are crushing a piece of Nissan Skyline history. Save the children, sell the car. Feed the hungry, sell the car. Give back to the community, sell the car at auction rather than just trying to prove a point by crushing some vehicles.